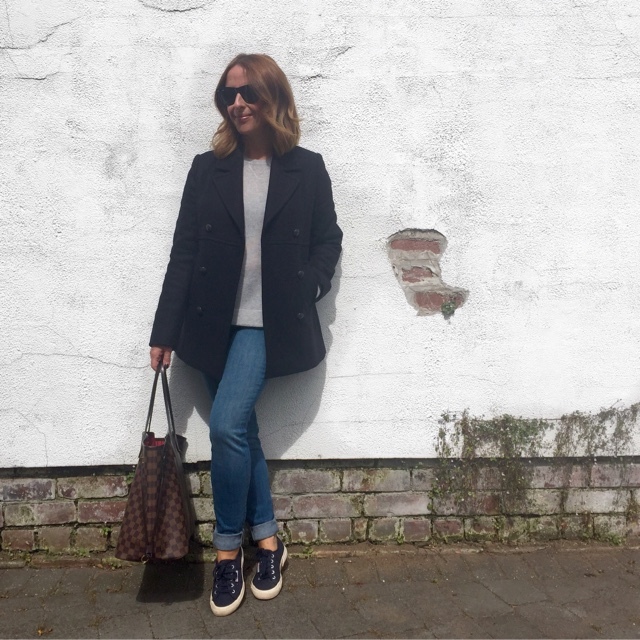 I was recently contacted by The White Company to try out their denim range and style it different ways for my normal weekend activities with the upcoming autumn season in mind ..... Oh yes and take over their Instagram account for the day. Yes, I re-read that email more than once double-checking ...... if it was meant for me! The first pair of jeans I tried were the Symons skinny jeans in a mid wash. What can I say ....... they are made from a lovely, soft quality denim, with a flattering mid rise that was very comfortable. The bonus of these particular jeans is that they run large ..... I normally wear a size 28 in jeans (UK10) and I could size down to an 8 in them ...... I haven't been a size 8 since I was about 8 years old!! They come in a 32 inch inside leg .... I just rolled mine up, which suits that casual look with plimsoles such as Supergas. What I really like about these skinny jeans is that they are not suction fit, but have a lovely slim and super flattering shape to them. Saturday mornings come September will be the ballet run, L has been going to baby ballet since she was 18 months old and now she is ready to start pre-primary class at a local "big girls" ballet school. 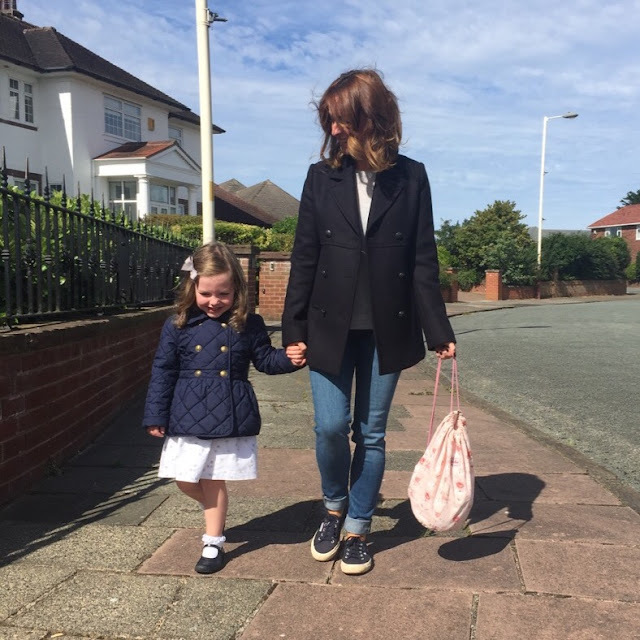 So, off we popped to enrol her wearing a classic look of jeans, grey cashmere top, navy pea coat and Superga's. Now, I do have to admit I was a little warm wearing this in August, but when the colder temperatures arrive this will be my go to outfit for ballet and the school run. Talking about the pea coat ....... I LOVE IT. It's a great piece for the tricky transitional period between the end of September and the true start of winter. 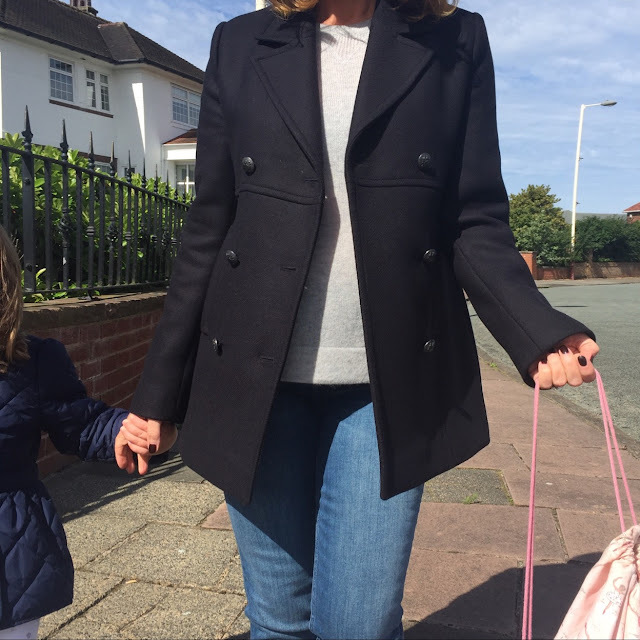 I have read many times that a navy pea coat is a classic coat worth investing in and as a lover of the humble navy blazer I was always keen to try one, they always look so chic layered over stripes! Did I say stripes .... what a shock! I tried two other pairs of The White Company jeans which I will be reviewing on FM40 in my next two posts, plus there will be an exciting giveaway for you all, so stayed tuned. That pea coat is stunning, makes me almost wish for Autumn already. Looks great with the grey jumper. Honestly it is just gorgeous, when i tried it on there was instant love. I have only been in a few shops this last fortnight and I have seen a few pea coats already I think they are going to be the coat to have, but they are always a classic. I've never brought anything from the White Company but the jeans look great, I love the look of their fit. Have never tried their jeans before, its a new line for them and I am very impresses. Their knitwear like their bedding is always sublime.